In October, 2017, I made a trip to City Hardwoods in Birmingham Alabama with my good friend Shawn Stone to pick up some rough sawn cherry lumber for an upcoming joint project. The project was a makeup vanity for his wife. Fast forward a month or so, and half way through the project, we finally realized a critical dimension error that was baked into the design. It’s kind of embarrassing to get that far in a project before realizing an error like this but…..crap happens, right. Long story short, we tried everything to modify the design but unfortunately the proportions just didn’t work with anything we tried to do. 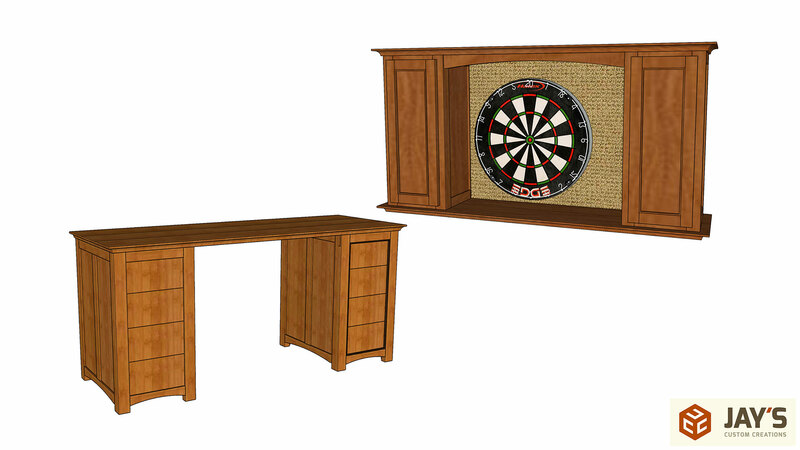 So rather than scrap the material we already cut up we decided divide the already completed work into two new projects; a dart board cabinet and probably a children’s desk or maybe with a bit more design work a media console of some kind. That means all of the video footage we shot for the vanity build is now going to be re-purposed for those two projects. So just keep in mind that the videos covering the first half of the build will be referencing the original vanity design and about halfway through the build we will switch over to the final design(s). After getting all of the lumber back to my shop I sticker stacked everything and let it rest for a couple of weeks. 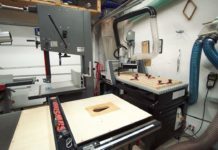 Letting material rest for a few weeks, or even longer, is recommended whenever possible because it allows the material to acclimate to your shop environment. If you do a good job of sticker stacking it before it rests you are less likely to have the material warp, cup, bow, or twist before you use it. We begin the project with the corner posts for all the cabinets. 16 in total. Four for each cabinet and there are four cabinets. Technically, the eight corner posts on the lower cabinets can be called legs since they do touch the floor. Any time you are going to have pieces with multiple visible faces it’s a good idea to try to get rift sawn lumber for those pieces. Flat sawn or plain sawn lumber and quarter sawn lumber have the grain primarily parallel to one of the faces when looking at the end grain. This results in two opposite faces having a straight grain appearance and the remaining two opposite faces having a wavy, cathedral grain appearance. Because of which, you never have two adjacent faces that look similar when working with flat sawn or quarter sawn lumber. Rift sawn lumber has the grain primarily on a 45 degree angle, or there about, to all four faces when looking at the end grain. Because the grain is about the same angle to all faces you get a similar, straight grain appearance on all faces. This is really ideal when it comes to legs or corner pieces where you want the grain to look consistent all the way around the board when you view it from multiple sides. The top board in this image has the left side with more of a rift sawn section and the right side with more of a quarter sawn section. We can use the end of the 8/4 board to visually identify the areas that will work best for the legs. To help with this process I outlined the grain with a marker and cut a paper template sized the same as our final dimensions. This allows us to get a great visual representation of the grain exactly how it will be in the final piece. In the case of this board it is wide enough to have both rift sawn lumber on the ends and a plain sawn section in the middle we can set aside for other parts. The first step in my milling process is normally to rough crosscut longer stock into more easily manageable sizes. In this case we did a rough rip cut first. Because the material we are after is only on the sides of the board if we just crosscut the entire piece then the center section that we are setting aside will be chopped down considerably. That would limit the use of that material in the future. 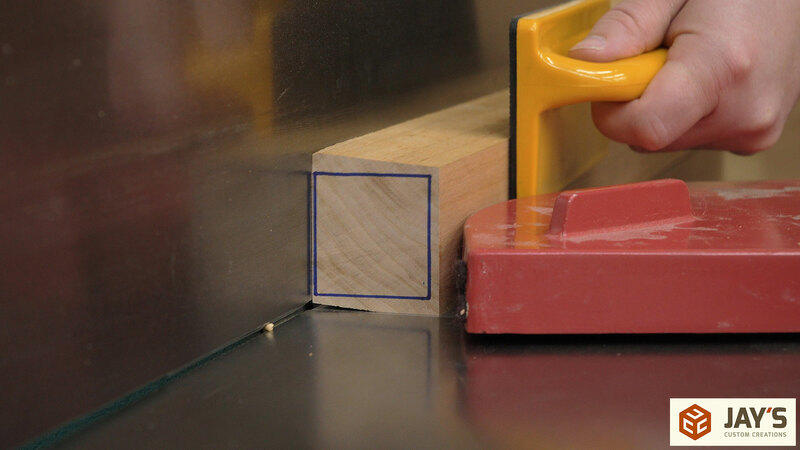 Making an initial rip cut will preserve the full length of the extra middle stock. The most ideal tool for rough rip cuts is the bandsaw but in this case the board is simply too long to safely manage through my bandsaw. So we used a circular saw instead. A few shallow cuts are better than deeper cuts in this case. Now the side pieces can be crosscut into slightly oversized blanks for the legs. I always use my miter saw for this. I built a miter saw station that really helps with breaking down lumber. Especially the longer stuff. In the past I haven’t done a good job at explaining how I safely use the miter saw for this task. 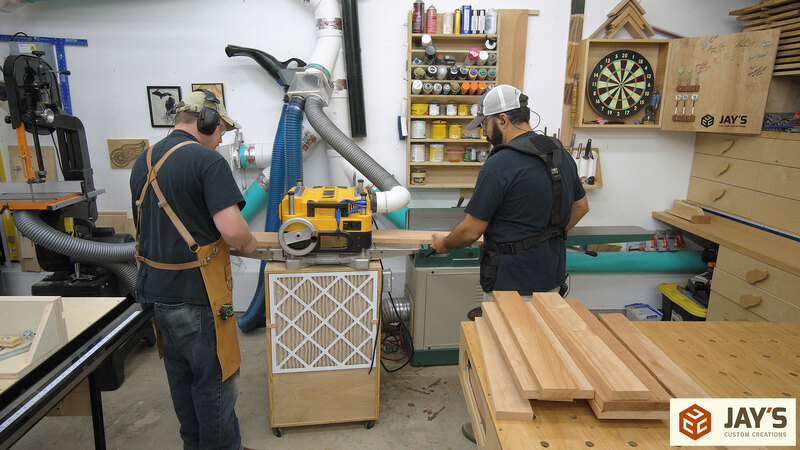 The most important thing to do when using any kind of miter saw is to make sure the material is properly referencing off of the fence of the saw. It’s also worth noting that my miter saw is positioned so that its fence is forward by a half-inch or so from the station fence. 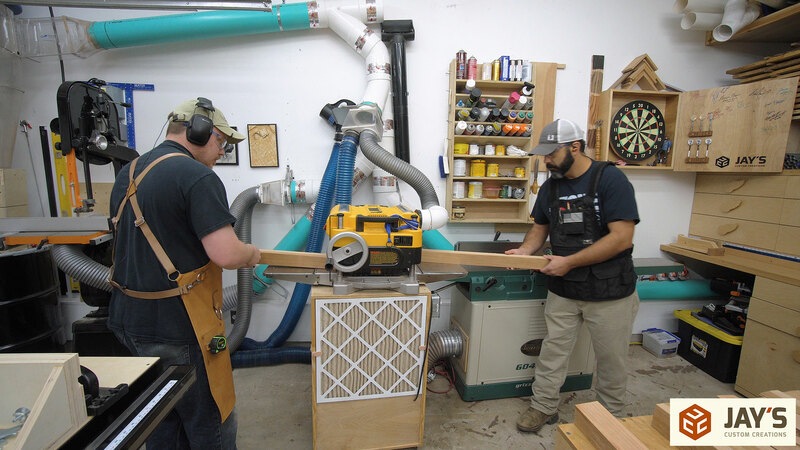 This is important because if the board you are trying to cut has a bow it might bottom out on the station fence which might prevent the board from touching the miter saw fence. 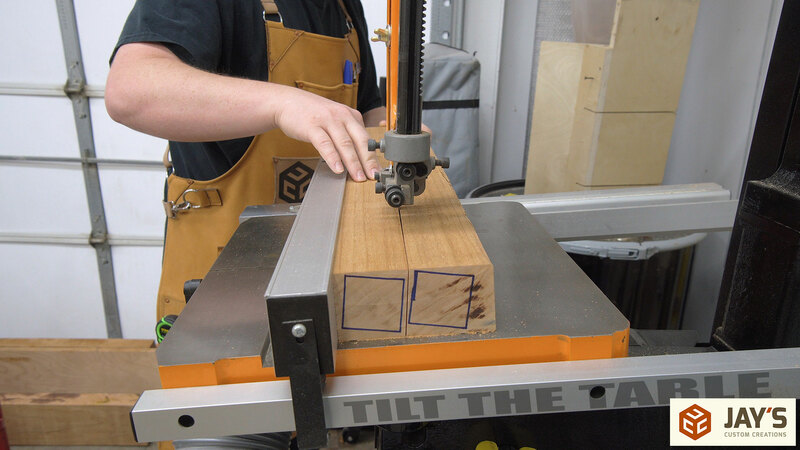 If you make a cut when the board is not touching the saw fence the piece can bind and the saw can dangerously slam the material against the saw fence. It’s the miter saw’s version of table saw kickback. With the saw fence forward by a little bit you can more easily make sure the board is in contact with the saw’s fence if the board has some bow to it. If you simply can’t get the material to reference off the miter saw’s fence then don’t use the miter saw and instead use a jigsaw or hand saw. The leg blanks can now be separated with a rip cut at the bandsaw. 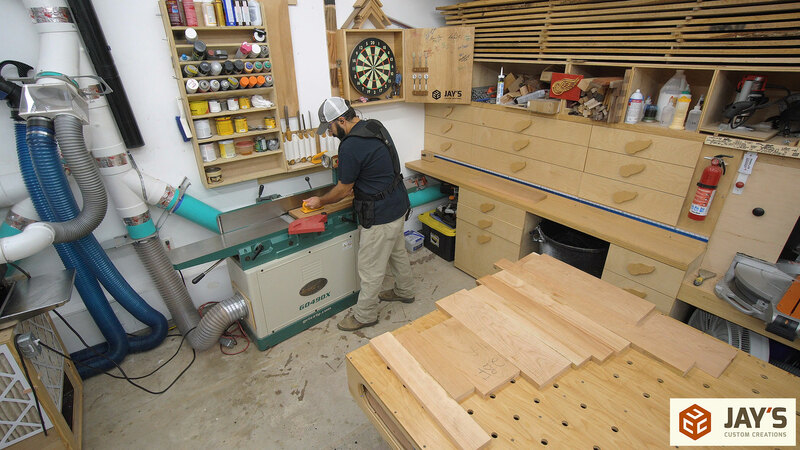 If the material you are using is already at a 45 degree angle you can keep the bandsaw table at 90 degrees. In this case we wanted to tweak the angle of the grain slightly so we tilted the table to what looked appropriate based upon our previous reference marks. It’s generally not recommended to do any rough rip cuts at the table saw. This is because with a rough sawn board the board can shift if it is not perfectly flat against the table top. Material shifting into the side of a table saw blade is just asking for kickback. Material shifting into the side of a bandsaw blade is much, much less dangerous. Next up is the jointer but before we get started I want to briefly discuss uphill vs downhill in regards to jointing and planing. It is important to joint and plane in the correct direction, the downhill direction. 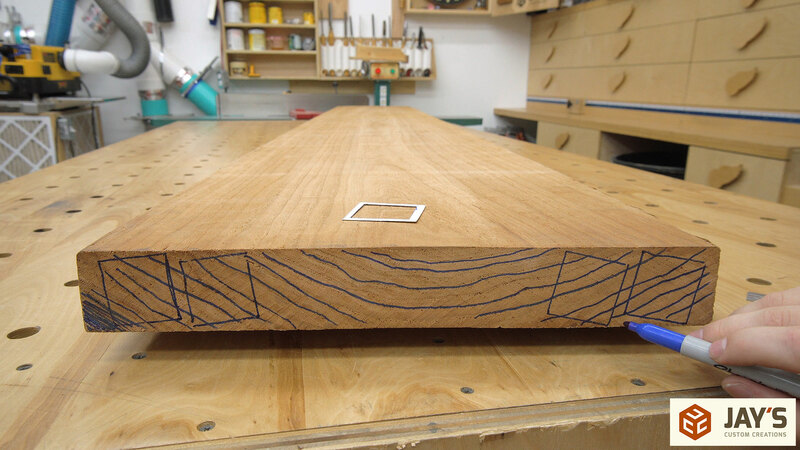 In the following image example lets pretend that we want to joint the top face of this oak board. 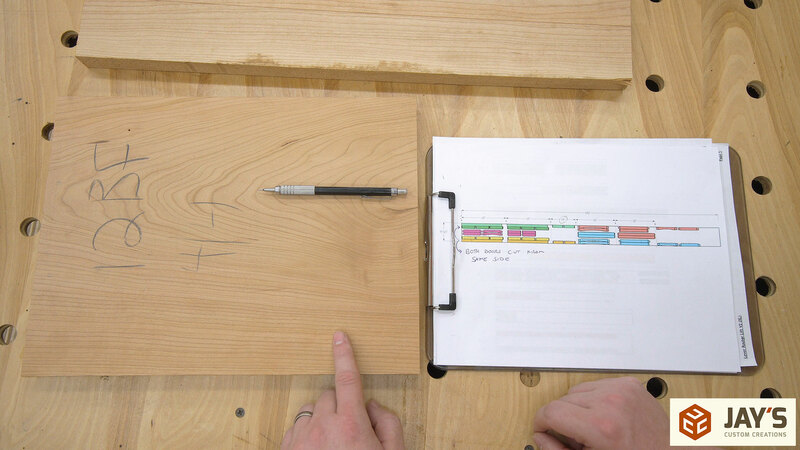 Take an adjacent face (the front face) and hold the board so that the grain is horizontal. This means that the downhill direction on the top face is from the left to the right. In this direction you won’t be digging into the grain and instead you will be slicing it. If you joint in the uphill direction (right to left) the cutting action will dig into the grain and tear out. Now the jointing can start. 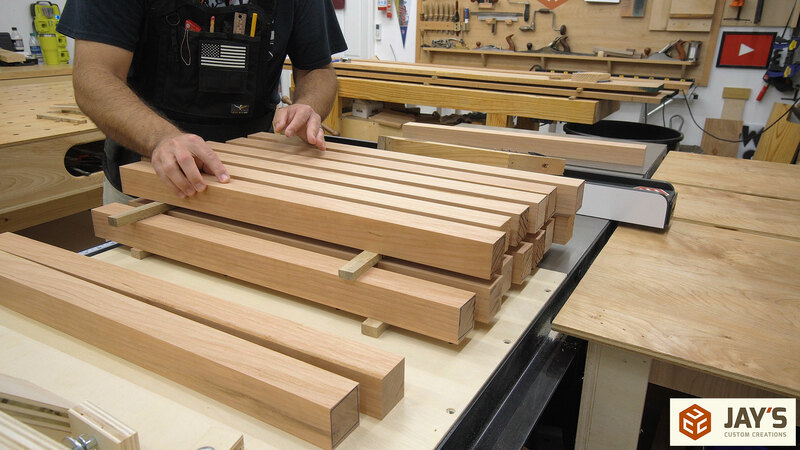 Any time you have a bunch of material to cut it’s always a good idea to take the time before you even start the tool to orient all of your pieces in the correct direction that they will be fed through the tool. This will reduce the amount of extra thinking required while operating the tool and allow you to focus more on using the tool safely and correctly. A this point we jointed all of the bansawn faces. Sometimes you can get away with jointing two adjacent faces immediately at the jointer. This isn’t always the case though. The problem is that when you joint one face you are forced to put that face against the fence to joint an adjacent face. Sometimes that forces you to joint in the uphill direction on the adjacent face. You simply don’t have any other option in that case because if you flip the board end for end the grain direction remains the same. The solution is to go to the planer first to plane the opposite face flat and parallel. 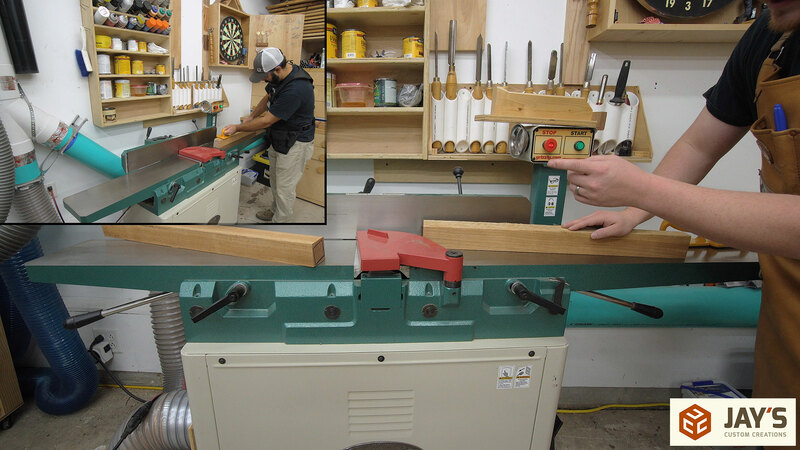 Then you can go back to the jointer to joint one of the adjacent faces flat and 90 degrees to the reference face. 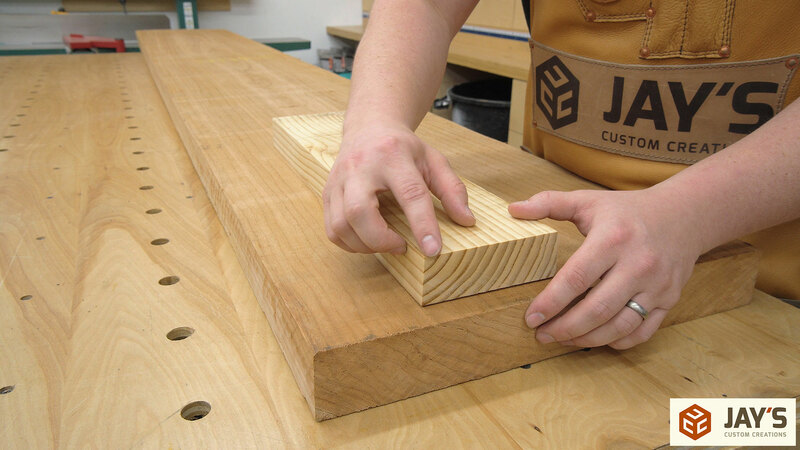 Having two flat and parallel faces to choose from at the jointer will allow you to twist the board 180 degrees to change the grain direction while still maintaining a flat face against the jointer fence. Remember that flipping the board end for end does not change the grain direction but spinning the board 180 degrees does. At this point three of the faces are flat and 90 degrees to one another. 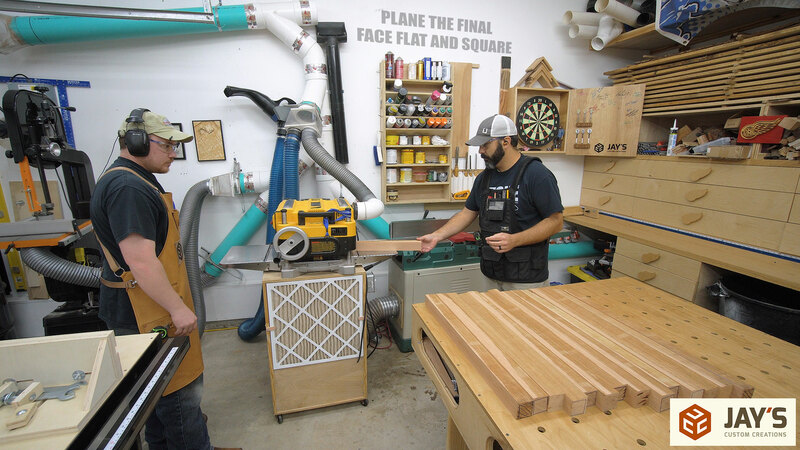 The fourth face is generally established at the table saw for rectangular boards but because all of our leg pieces are square we went back to the planer one final time to establish the final face. Now the first milling is done and we’re not quite down to our final thickness. It is best to break up the milling stage over a few days if possible. 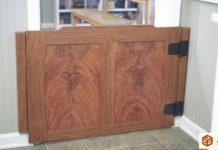 Doing so will allow the boards to rest and release any internal stresses that might be evident in the board. 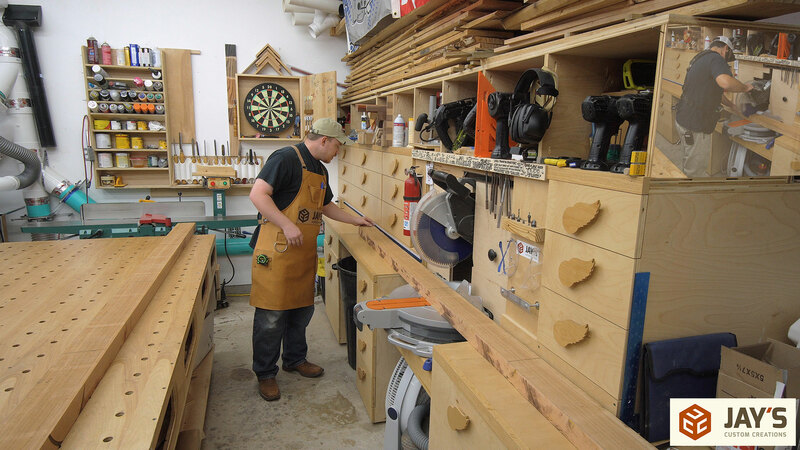 After a couple of days the milling process is repeated once more and any cup or bow that was introduced to the boards while resting can be milled out as you get down to the final thickness. In between milling, or when taking a break from the project, be sure to sticker stack your material. Sticker stacking…do it! Stickers are small boards you place in between all of your other boards. Stacking material like this allows the material to be exposed to air evenly on all faces. This is important. 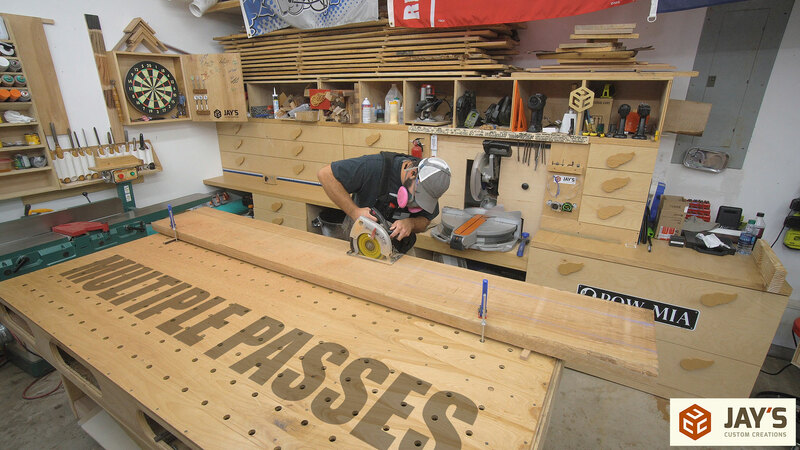 Boards will expand and contract more evenly when all faces are exposed evenly to the air. If one face is laying flat on a table the opposite face will gain or lose moisture at a different rate than the face that is not exposed to the shop air. Different rates of moisture change will cause the board to cup or bow. While the leg pieces rest we started milling the rails and stiles. Luckily, we were able to find a wide board that had very few defects. But, unfortunately, with a wide board you generally have inconsistent grain appearance along the width. On the plus side we will have great color consistency throughout this board. On the down side we will have to be a little more selective with where each part is cut out. 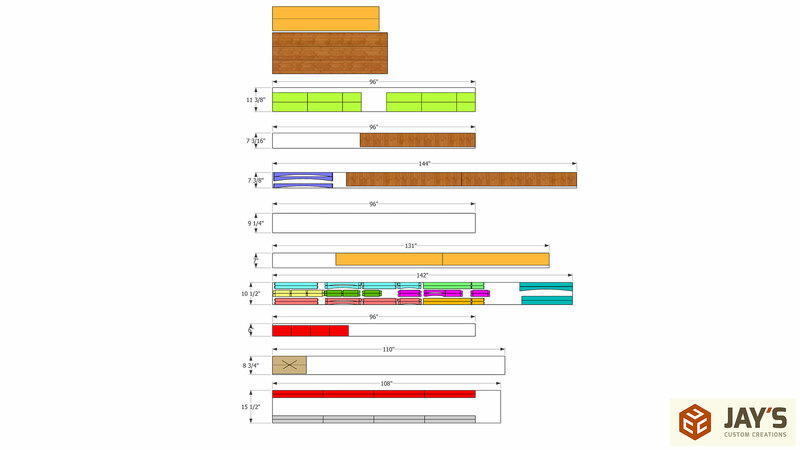 To maximize the yield I took my original SketchUp model and laid out as many pieces that would fit on a rectangle sized to the usable dimensions of the board. This gives me rough cut locations to start the milling process. This generally results in less waste and a better selection of wood. It might seem like a lot of work to do this step in SketchUp but it’s not bad at all…definitely worth it. In the following image we can see the grain characteristics of the board for all the cabinet rails and stiles and door rails and stiles. The board is pretty wide and the grain is not centered. The top half of the board is plain sawn so the face shows flat, cathedral style grain while the lower half of the board is rift sawn which is really consistent straight grain. At this stage (already rough crosscut) we can determine the placement of each piece to get the face grain we want. The main focal point of the upper cabinets will be the doors. Those will be closest to your eyes and slightly cover up the cabinets behind them. That means I want to put the most emphasis on the door parts and therefore cut all of those parts out of the rift sawn section near the bottom. That leaves a wide section at the top that will be wide enough to get the rest of the cabinet rail and stiles. This also means that the rail and stiles will all be similar in grain appearance. Another thing to take into consideration when dividing up the board is the capacity of your tools. I have an 8” jointer so I first ripped the rail and stile stock at the bandsaw to fit the jointer bed. Luckily it was a convenient measurement for the previously mentioned layout. Again, laying out all of the pieces in the correct orientation before starting the tool helps in efficiency and reduces the opportunity for error while the machine is running. And finally the rail and stile stock is planed to 7/8” thickness. The final target is 3/4” thick so this gives us enough material for the final milling after the pieces sit for a day or two. In the next installment of this series we will tackle the 64 mortises on the leg and corner pieces. This is one of the most informational video yet. You hit on points that I never thought about. Thanks for the lesson. Thanks for all the detailed explanations on grain direction for milling; also, the detailed layout of the original boards. 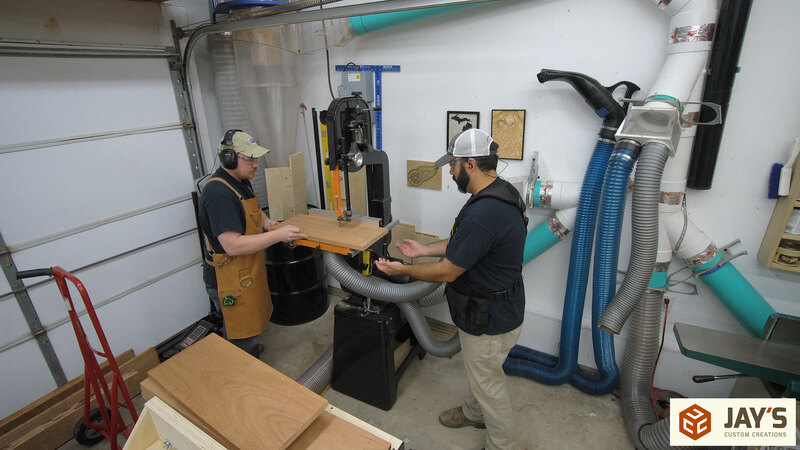 Your method of teaching is outstanding for woodworkers of all skill levels. Thanks for the information. Keep up the great work and video’s, i guess your a jack of all trades, not just carpentry. I really use a lot of your ideas and inventions. Have a great day. Great video! 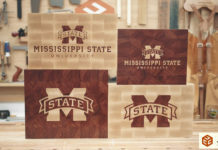 Thank you very much for the lesson on wood grain analysis and milling. More, please! Have a great week. A badly needed and very well done video. I will never examine a project board as carelessly as in the past. This is a fantastic video and text narrative. Great teaching of an often neglected issue (pointing the finger at me). Thanks Jay. I’ve learned a lot from your tutorials, etc, even at 75 years old. I particularly appreciate the text and photos, as my little shop is out in the boonies with no network. 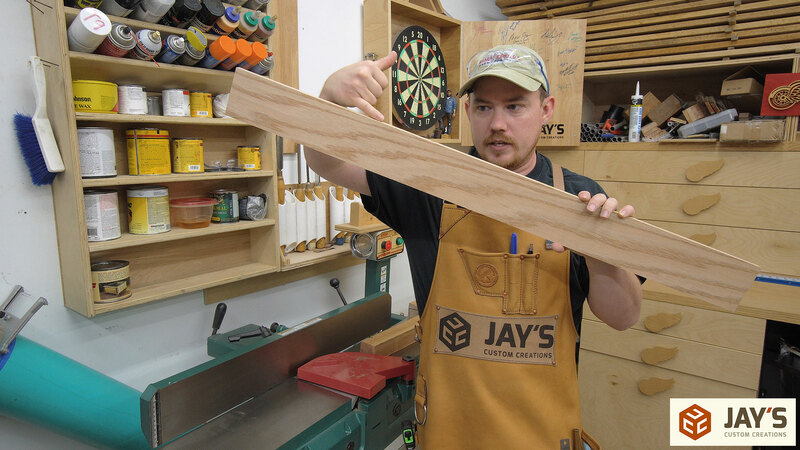 Thanks Jay brilliant video on an essential aspect of woodworking that you explained and demonstrated so well.